You are here: Home » News » Live And Let Live CD – Special Offer! Live And Let Live CD – Special Offer! Following our special offers on the Reading Rock & MMX DVDs, we have decided to continue with another promotion this month! 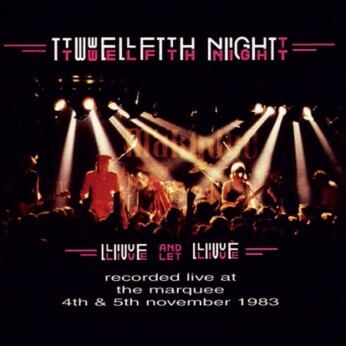 So for the month of November – to celebrate the 30th anniversary of two of the best gigs we ever did – the Live And Let Live: Definitive Edition double CD is available at the special price of just £8 (one third off its normal retail price). Live And Let Live was recorded over 2 memorable nights at the world-famous Marquee Club in London back in November 1983. The gigs were singer Geoff Mann’s last ones with the band, and as a result both nights were emotionally charged: in the opinion of all band members among the very best the band ever played. This double CD set includes a number of unreleased, remixed and remastered performances, reconstructing the entire set from the best available sources. As a result we are delighted to be able to present the album with every track we played both nights in the right order. It was, and still is, a fitting tribute to our dear friend Geoff. There is also a 24-page full-colour booklet with the lyrics from all the songs (illustrated with many previously unseen photos), new sleevenotes from Brian Devoil and Andrew Wild, all lovingly put together by the master designer Paul Tippett. It is the most lavish booklet we have done to date – and Dave Robinson from Festival Music says he thinks it’s the best one yet!